Here is a classic Cape Cod style of home. Cape Cod homes are generally 1 story or 1-1⁄2 story houses with steep pitched gabled roofs that often have livable attic space. The rear portion of these steep roofs can be built with a shed roof (with a minimum pitch) that allows more head room inside, thus allowing more living space in the upper story or attic. Capes usually have shutters and are sided with clapboard or shingles. These classic designs are very popular in the North Eastern states and, because of the steep pitched roof, are better suited for snow than many other designs. 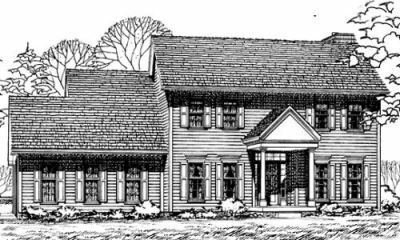 Using the cost estimating software found on my cost estimating page, and using Concord NH as the locale, I arrived at an estimated (rough) total cost to build this attractive home of $346,093, or $127 per sq ft of heated living area. This includes permits and utilities, insurance, and a General Contractor markup of $39,512. Land and possible related fees (if any) are NOT included. Read more on fees on my Checklist for buying land on How to Buy Land and Build a House. The criteria I used for the estimating software was Quality Class 4. Main Floor 1428 sq. ft.
Upper Floor 1304 sq. ft.
Total living area 2732 sq. ft. Unfinished Basement 1428 sq. ft.
One Zero-clearance insulated prefab metal fireplace with a brick facing. You should keep in mind that the cost to build for this example, or any house plan, can vary considerably depending on the quality of materials selected, and on actual bids for labor and material. The estimate for this house is an approximate one. Important Notice: Use the free estimating software to update this 2018 estimate to see if the cost has changed. You can also experiment with different building quality inputs that affect the cost to build.